The Take That star, whose new single Candy has taken the top spot in this week's chart, admitted he likes performing other stars' tracks while lathering up. Asked in an iTunes Twitter chat with fans what he sang in the shower, Robbie replied: "Other artists. Right now it's Call Me Maybe." The new dad, who is married to actress Ayda Field, also revealed that he often raps to his newborn daughter Theodora "Teddy" Rose instead of singing her lullabies. "The Chronic, Dre Dre, Ain't Nothing But A G Thang cos nursery rhymes are boring," he quipped. 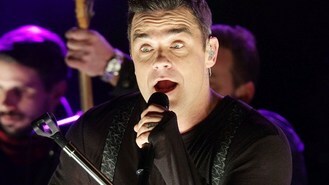 Robbie - who has also released a new album Take The Crown - insisted that he would record a festive album in the future, and revealed he would start writing new material next year. "I've got a few Christmases left, so I'll do it in the future," he said. He also admitted that if he had a super-power, he would "clone myself and send myself to work".